Ponto Plus offers access to the widest range of wireless options without compromising on power and sound quality. Built on the Inium platform, Ponto Plus features a new powerful transducer, the innovative Inium feedback shield and the latest Bluetooth 2.4 GHz wireless technology. All in addition to the well know features of Ponto. It has been robustly designed to meet the challenges of everyday activities. So you can enjoy better hearing when you need it most. 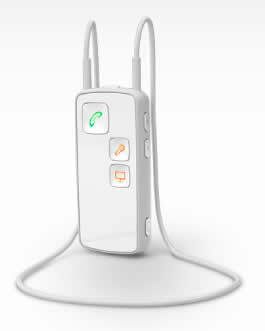 Ponto Plus is the most powerful ear-level bone anchored sound processor family in the market. Thanks to the optimized design of the new transducer, Ponto Plus delivers more output in the mid to high frequency range. So you can enjoy more of the everyday sounds and more power where it is most needed. Ponto Plus features our most advanced feedback protection system ever, the Inium feedback shield, including for the first time in a bone anchored hearing system, a novel frequency shift, designed to give less whistling and fewer artificial sounds as you move through changing sound environments throughout the day. With help from the Ponto Streamer you can connect your Ponto Plus to the widest range of wireless options without compromising on power and sound quality. All controlled by one device. Ponto Plus contains all the well known features of Ponto, designed to automatically adjust to the situation and the environment and provide the superior sound quality which Ponto is renowned for. Communication is an integral part of today’s fast-paced world. With Ponto Streamer you can enjoy wireless access to your most important communication devices, as well as looped environments through its built-in telecoil. The Ponto Streamer can transmit most audio sources wirelessly to your Ponto Plus sound processor. For example, when used with your cell phone, it turns your sound processor into a wireless headset. It also functions as a remote control for the sound processor making it easy to change program or adjust the volume. To enjoy music using the Ponto Streamer, simply connect it to your PC or MP3 player using a cable or via Bluetooth. Our implant range includes Digisonic® SP and Digisonic® SP EVO cochlear implants and Digisonic® SP ABI brainstem implant. The Digisonic® SP is renowned for being robust, reliable and easy to insert. The Digisonic® SP implant is the most compact implant on the market thanks to the encapsulation of the magnet and the receiver in the same ceramic casing. For over 30 years, ceramic materials have demonstrated their strength and high shock resistance in the medical field. Combining this robust material with a titanium base requires state of the art expertise and technology possessed only by Oticon Medical. Our implant is designed so that the surgery can be as minimal invasive as possible. A screw fixation system holds the implant in place. This unique technique provides a secure fit of the implant and allows the surgeon to avoid drilling a bone bed in the skull. This also reduces surgical time and healing complications. The Digisonic® SP implant range is compatible with MRI tests at 1,5 Tesla, commonly used in clinical practice. Find out more about medical examinations. Different types of electrode-arrays are available on the Digisonic® SP cochlear implant, all designed for an easy insertion to preserve the cochlea and ensure the process is as atraumatic as possible. The Saphyr® neo collection sound processor is designed to provide a better speech understanding in the most challenging environments thanks to its advanced sound processing technologies and an easy access to wireless hearing systems.